Its such a great time to be investing in Boise Real Estate! I saw the following listing go up 2 days ago and immediately thought of those investors out there looking for a great deal! 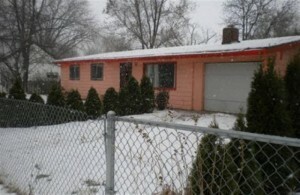 3121 Targee is a 4 bed, 2 bath 1300 sq ft home up on the Vista Bench going for $45,000. Yea, it needs some love, but not much to get it rentable; probably around $5K (at least that’s all I’d put into it). It would be perfect for a bunch of college guys looking for a cheap place to live (in fact, I lived in a place much like this during college!). Cap Rate comes in at almost 10%, which for this market is pretty great. It easily Cash Flows with 25% down at about $190 / month or $2,272 annually. And with 25% down you see a Cash on Cash Return of 38% which is excellent. Of course, with any investment you’ll want to do your homework. If you want to take a look at the property feel free to contact me. I’m available anytime the Bears aren’t playing ;-). And if you are looking for a good property management company I’d recommend you talk with Jake Niemeier of Investors Property Management. Also, I would recommend KatieÂ Crandlemire over at Sterling Savings Bank for any loan needs you may have. Realtor and full-time Real Estate agent in Boise, ID! And by agent, I mean Real Estate Ninja. Basically I'll do things like return your phone call and not treat you like a jerk. Connect with me on Google+.